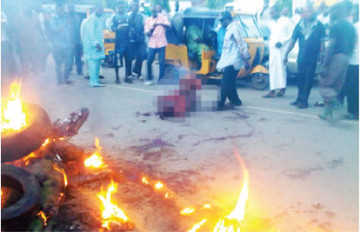 FN source learnt on Thursday that the robbers were set on fire on Wednesday evening, shortly after robbing a recharge card trader at Second Junction bus stop on Governor’s Road. Our source correspondent, who visited the area, observed burnt tyres, carcass of a burnt motorcycle and some human flesh on the side of the road. Our source correspondent learnt that the robbers allegedly snatched a motorcycle and shot a man in the area and were fleeing when a motorist knocked them down. Our source correspondent learnt that a team of policemen from Ikotun Police Station stormed the scene and attempted to rescue the robbers but were overwhelmed by the mob.